DOUBLE BILL!! 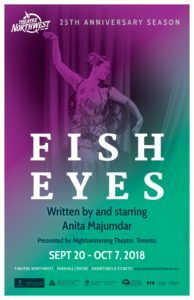 Two audacious and exciting plays (Fish Eyes and Let Me Borrow That Top), by celebrated theatre, television and film actress Anita Majumdar, tell the coming-of-age stories of two teenage girls in small town Canada. This award-winning solo tour-de-force fuses exceptional Bollywood dance and Kathakali storytelling to create a truly unique theatrical experience.